My Grandma loves to paint, was unable to after her sister passed away. This is her first painting in 3 years! That's beautiful! Make sure to frame it!! We have almost all of her artwork framed, I’m very proud of her! He did do the nasty in the pasty. Not to argue but I'm way closer to my friends than family members. I either have zero relationship or don't really get along with a lot of them. My closest friends are my real family. I usually spend holidays with at least one of them. Love it! 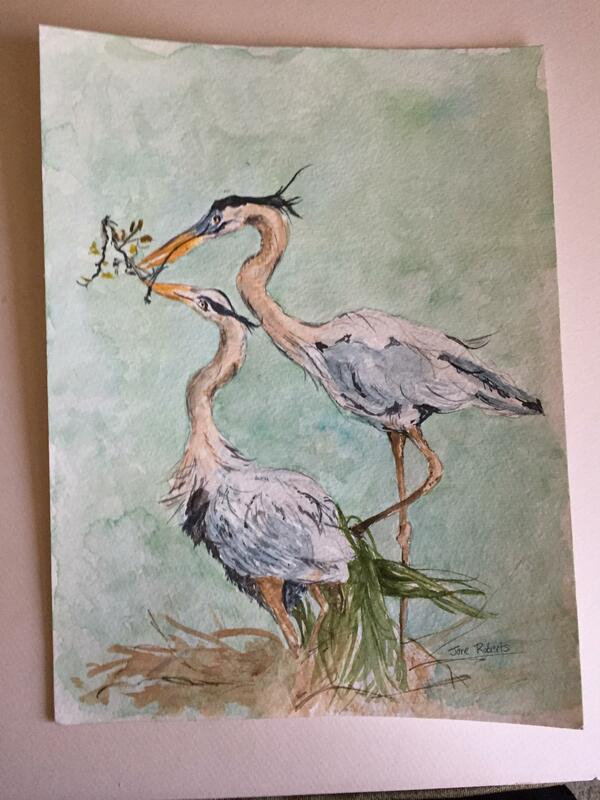 That is very appropriate use of water color, she really captured the "feel" of the majestic Great Blue Herons! That's what I saw Great Blue Herons. Great work! Yeah, I would be proud to adorn that on any wall. Have you ever considered approaching a museum to see if they would open a temporary gallery for the world to see her talent? And they are great blue herons, for anyone wondering. She has exquisite talent! Bravo!!! I dearly miss my Mema. A part of me passed, when she had. God Bless Grandmas!!! Grandma you blew up on Reddit! Followed by fig newton bars probably. Beautiful! I just read a story on line about a man in Croatia who has been taking care of a stork that was injured for 25 years - she can't fly. The article said that 15 years ago, a male stork stopped and has been returning ever since and they have had many stork babies. This picture reminds me of that story. I agree and me too. Water works over here. Real comment here - can you help me see it that way? I see it as the two birds helping each other. But the one that is mid sitting down seems to be handing off the branch to the taller one about to take off. You could view this as the sitting/resting one as the sister who has passed and the one about to take the branch as the grandmother,the artist, as she takes on her sister’s and family’s story and leaves without her sister, who is at rest. The stories and the legacy of those who have left us is all we really have. It is those stories that help us remember things. How they sounded when they talked. Their laugh. The jokes they told. How they or their their house smelled. How they answered the phone. How they touched your life. How they were your hero. You see pictures and that is one thing, but it is these other things that get hard to remember as time goes on. The little things get hard to remember. I dont care if you told me the story 100 times, I want to hear it again. That sort of thing. Thanks helping me see that. Clear as day now. Wow, I just had a moment. So many people and I try to remember but it is hard. I try to let a part of them live on through me. Thanks again. But objectively it is clearly a mating pair of blue herons building a nest. I was going to say the same thing. It about made me cry. i know what that is like and picking up that brush again is the best choice she could make. Got any more pictures / paintings? I like this one. I’m going to post more of her early work tomorrow! This reminded me of something that happened with my family. My aunt was a classical pianist, and her daughter, my cousin, is a professional harpist that plays with the local philharmonic. When my aunt passed, her daughter played her harp at the funeral, accompanied by a recording of her mom at the piano. She was crying her eyes out as she played, and it was the most moving piece of music I have ever heard. She's amazing! This is a billion times better than anything I've ever made. If you read this, tell her that I love it! Aww thank you! I’m going to call her tomorrow, I’ll tell her that everyone is supporting her! Here the viewers can see it better after i straighten the image curvature and squared it to imitate like it was scanned on a scanner. Beautiful, beautiful art work. Would love to see more. I’m going to ask her to send more pictures of her work tomorrow! Maybe get her on Etsy? I’d buy one. My friend's wife is having the same issue after the death of her mother. What changed or how did she change her mindset and begin to paint after her loss? I'm trying to figure out how to get my friend's wife to paint again. Mostly time, but what helped her a lot was switching mediums for a while. She started working with clay before she could use her watercolors again. that s really smart ov her to channel her creative energy through a divverent path. I love the bedraggled look she gave the herons. Its got a gritty realism look to it. Tell her to definitely keep it up! She should never stop. This. This is beautiful. Alternative title: Painting of birds. Oh my! What talent and design. I love this. Your grandmother would clean up at the art festivals in Jersey shore towns. This is beautiful and evocative. My location, my mom and I agreed this would fit perfectly anywhere in our house! Me too. OP, ask grandma if she wants to make some extra money to take to the casino. She needs an Etsy store with this as the name! No. There has been enough death already. Average content upvoted to the front page for the backstory title that may or may not be true. This reminds me so much of my own grandmother's paintings and her teaching me to use watercolor as a kid. I really cherish that time I got to spend with her before she passed and share something we both loved. OP, hug your grandma for me and tell her a fellow painter loves her work! Would absolutely buy a print of this!!! Way to go Grandma!!!! We love you! That is so beautiful! She is very gifted. What?! Go, grandma! I have a painting my husband's grandma did that is very similar to this, makes me happy to see it. I’m going to call her tomorrow, I’m sure she’ll be happy to know that her artwork is well appreciated! I’m really happy and proud of her and everyone else supporting her work! Not only would I hang this on my wall, it inspires me to try to do it. She's inspirational. As someone who has just started painting and drawing again after trauma, I’m sure your grandmother will appreciate all of the admiration and love we’re all sending her! Tell her we’d love to see more of her art work! I’d like to think those two cranes are your grandmother and her sister. Beautiful. I hope she keeps painting! We have alot of ugly in our world these days, please tell Grandma that her painting put me at ease while I admired it. Beautiful! I hope she continues. Your grandma is a talented lady! I hope you’re grandma keeps painting and that it brings her joy. She does wonderful work. Some sort of olive branch. Siblings will know what I'm talking about. Beautiful! I wish I were as talented! This is so beautiful. 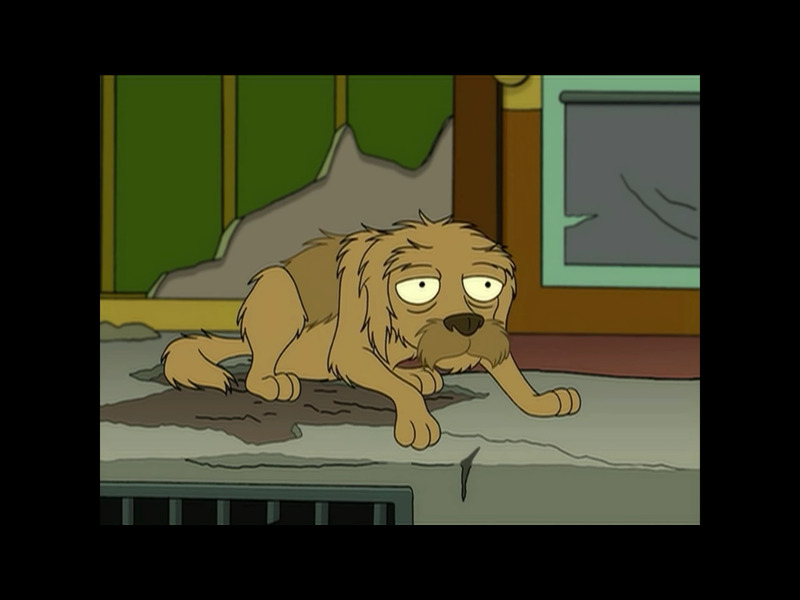 I hope she was able to find some peace after her sister's passing. I love my brother (older by 4 years) and don't know what I would do if I had to go on without him. Please let her know that she's an inspiration. Her art is AMAZING! I want to become an amazing artist and she has blown my mind with that painting. Send her my (and reddit's) love!! Kudos to her. I love drawing but haven't been able to draw anything since my mom passed away. Really happy to see that this is something that can be overcome. Beautiful. Without knowing pain, you don't get art like this. Whether it's a painting, a song, a dance, etc. This is my favorite are style. This painting is awesome! Does she have friends she likes to send cards or whatever to? I work for a print shop and these old ladies come in all the time and we scan their artwork and then print it on fold open cards and they buy the cards and envelopes. Oh that sounds so sweet! I’ll ask her if she would be interested in this! Thank you so much! What all did she use for this? Watercolors! Even for the fine lines, she used a dry brush. It's very good. I'm glad she's doing better in the sense that she is painting again. That's awesome! Grandma is very talented. Wow. Beautiful. Tell her to keep it up. She's very talented. I bet she doesn't like to paint feet. My stepmother doesn't like to paint hands and feet, and always finds a way to obscure them. Little things you learn when you know the artist. Reminds me an Audobon piece. This is so lovely! And I love the colors she used. Such a simple yet incredibly symbolic painting. I can feel the grief/emotion coming through this picture. It’s filled with so much love, and moreover, coming to terms with what’s happened. I’m so happy your grandmother was able to pick up those brushes again. She is profoundly talented. As a blue heron fanatic i approve; make sure to tell her how amazing this painting is. It's almost like if Seuss was serious. Love it! Actually, my grandma is an identical twin! Maybe a few minutes older? No, it is a mating pair of blue herons building a nest. This painting is beautiful. I would love to see some of her other paintings. After all the positivity, I’ll be sure to post some of her previous work! This is a gorgeous painting. Awesome painting ..but I had never seen two Blue Herons together......now I have. It is a mating pair building a nest. Totally a real thing. Makes sense...we have had a nest somewhere in the brush by our creek. Every year it lands in our yard and walks back in there....have had one almost clip me landing feet away..but only one at a time.. neat stuff. Beautiful and well done grandma. Oh I hope she continues to paint, she has wonderful talent. I would totally hang that in my house. Also, so sorry for her/your loss. Are those great blue herons? That's awesome. Beautiful watercolor. Tell her that we love it! Awww thank you! I’m not sure she knows what Reddit is but I know she’ll be happy to hear about all the love and support her art received! The colors are spot-on. I love that you can see personality in the herons--she's very talented! Beautiful work. She is very talented! Beautiful. I'm glad your Grandma re-found a passion of hers. I hope it's cathartic for her. beautiful. I see two sisters enjoying life in the painting. Its special when its Great Blue Herons under going a mating ritual...new life. The piece of art has a fascinating texture. Tell her we want to see more! I’m planing on posting more of her work tomorrow! Beautiful! How did she even think of such a sweet scene? It was in a nature magazine I believe. While I'm not sure granny would love that elephant painting, this article was fascinating! Thanks for posting it. Thank you! Her birthday is in March so I might get it for her then. He is a marvelous artist. Can I commission a painting for my baby daughter? I’ll ask her, but she typically doesn’t paint people. Thank you so much for your support and thoughts! I’ll call her tomorrow and ask, maybe we’ll get a Esty set up! I mean she can paint whatever, I just want one for my baby’s room. Oh I’m sorry for the misunderstanding! I’d be glad to ask! Does the subject represent her and her sister? It's kinda a tender scene. Honestly, I didn’t ask. She did pick this one out of all the other pictures in a nature magazine, so it’s entirely possible. I doubt it as that is clearly a mating pair building a nest. Gram Gram got skills! Encourage her to continue, this is beautiful! Beautiful. You should be so proud of her! I love this! Knowing the story behind it gives it extra meaning too! Brilliant conveying of movement. Full of life. Absolutely beautiful!! Tell her to keep creating, the world needs more beauty! Very beautiful! It has an oriental flare to it. Gorgeous! She’s very talented! Tell her a random internet stranger loves her work! Captured everything. Thank you for posting. Good for her! What a great painting! Maybe it’s an expression of her grief over her sister. Look at the way the birds are oriented. That’s really beautiful. Glad she is painting again. Was she the younger one? She is an identical twin actually!